Now that Spring is officially here, it is finally time to start incorporating a few new pieces outdoors and in to help freshen up your space. It is important to remember that this is not a full decor makeover, rather a seasonal change that doesn’t have to break the bank! Just like the flowers starting to bloom, and the trees bringing back their green leaves, it is time for us all to transition with the new season. Front Porch Love – When transitioning from one season to the next, this is the first place to start! The outdoor appearance of your home reflects the feelings you want to achieve indoors. It is the place that gives the first impression to not only you, but to anyone passing by. Freshen it up with a new wreath, a couple of planters and a porch sign. This will automatically brighten up your home! 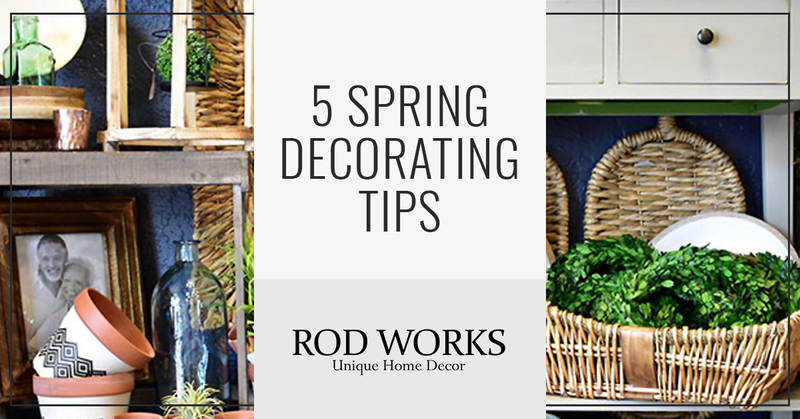 Spring Clean – Pull out any accessories or items that make your space feel too warm and wintry. Less is more this time of year, so try your best to minimize the amount of pillows, blankets, or wintry decor items you have occupying useful space. This will also force you to dust and vacuum spaces that have been neglected throughout the winter months. Incorporate a couple of new items – We’ve got new decor items coming in weekly that fit all decorating styles. Whether it is a new planter, pillows, or greenery, having a couple of new items make your space feel fresh and new without having to spend a lot of money. Add a pop of color – There is something about spring colors that just make you happy! Adding an accent color around the house can help perk things up right away. The key to adding color is to stay true to you and what you like, don’t incorporate traditional spring colors if that isn’t you. Color can be incorporated into your decor with accent pieces. These can be pillows, pottery, clocks, frames, florals…you name it. You will be surprised at how much adding a dash of color can create a more joyful living space. Fresh Scents – If you haven’t put your wintry scents away yet…now is the time! Say “see ya later” to the warm scents of fall and winter, and bring in a new fresh scent into your home. Lemon, mango, mint, and lavender are all the perfect touch to achieve all of those spring time feels!